Answer XAT Decision Making Question no. 1 – 2 on the basis of the information given in the following case. 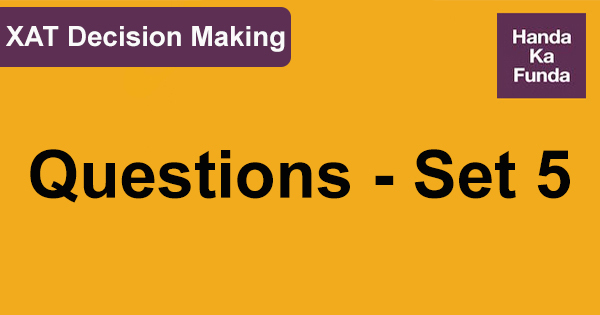 XAT Decision Making Question 1. Which, out of the following, could be the least likely reason for decline in the performance of the ‘Dark-Knights’? XAT Decision Making Question 2. You decide to sit with Narayan Murthy and try to establish the reasons for the decline in performance of his team. What came out of the meeting was that some of the members of the cluster were not happy with the kind of perks they got after winning the award for the second time last year. They felt that this was not adequate compensation for their effort and that they deserved more. Which, out of the following, is a corrective measure that can be taken by you? XAT Decision Making Answer 1. The cluster has not been able to learn on the job and have suffered from poor directions.